Originally invented in 1887, dishwashers have grown into one of the most used luxury appliances within the home, with roughly 40% of UK adults owning such an appliance – and for good reason. Whilst dishwashers are one of the most used appliances in the home, they don’t come without the risk of faults – and one such fault is they can become blocked. Thankfully, this is a relatively easy issue to fix and in this post, we explain the 3 main areas where a blockage is likely to form and how to remove it. 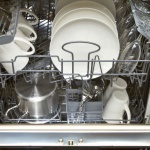 A common blockage on dishwashers is a blocked filter. The reason these are prone to becoming blocked is because their job is to capture any debris before it has the chance to reach the pump and cause further issues. It’s therefore important to make sure you are regularly checking and cleaning your dishwasher’s filter – to not only prevent it from becoming blocked, but to prevent it from becoming damaged. You’ll find the filter at the bottom of your dishwasher, and they can be removed either by pulling or twisting them – as outlined in our video, below, “How to Replace the Filter on a Dishwasher – Siemens”. Once the filter has been removed from your dishwasher, we recommend you empty any debris which may have been caught within it, before running it under hot water to ensure any grease is removed. If the drain hose on your dishwasher is blocked, you’ll need to firstly switch off the water at its source before disconnecting the appliance from the electrics. Once you’ve done this you can remove the drain hose. To remove the drain hose, we recommend you follow the guidance outlined in the “How to Replace the Drain Hose on a Dishwasher” video below. Once you’ve successfully removed the hose from your dishwasher run high pressure water through it to remove any blockages. It may be necessary to squeeze along the hose as you attempt to remove a blockage to help dislodge and force the debris out – although take care when doing so, as you don’t want to split or damage the hose itself. Once the blockage has been removed, refit the drain hose to your dishwasher by reversing the steps you took to remove the hose. As with the filters in your dishwasher, the spray arms are susceptible to being blocked by food debris. Unfortunately, if the spray arms become blocked water will not be distributed to your dishes, simply meaning they won’t come clean. Hold the spray arms under warm running water to remove any dirt and debris. If debris is lodged in the holes of your spray arms, use a toothpick to dislodge it. Reattach the spray arms, tighten the centre bolt using the wrench, add the trays back into your appliance and you’re ready to use it again. 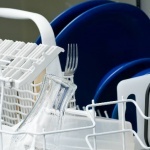 Whilst the above are some of the areas of your dishwasher which can easily become blocked and prevent the appliance from working to its full potential, they can be prevented by carrying out a monthly service wash. Such a wash involves putting the appliance on a full cycle, when it’s empty and adding the eSpares Limescale and Detergent Remover. The cleaner will remove a range of dirt and grime that has the potential to cause blockages – ensuring your appliance continues to run at its peak performance for longer. Take the time to regularly check the three areas mentioned above, remove any blockages which may be found and there’s no reason why you cannot benefit from your dishwasher running at its peak performance for years to come – leaving you with crystal clean glasses, pots and pans.